I’m honored to receive yet another amazing Sonic Divide composition, this time from Asha Srinivasan. In this piece Asha gives me some structure to create a piece on the spot using the time of day and date in the calendar to create a piece for voice and found objects percussion. It’s perfect in every way and perfectly blends Indian and Western music ideas. Bravo, Asha!! Eric Funk just sent me his contribution to Sonic Divide. It’s a gorgeous meditation on life and solitude and our place in these vast cosmos. 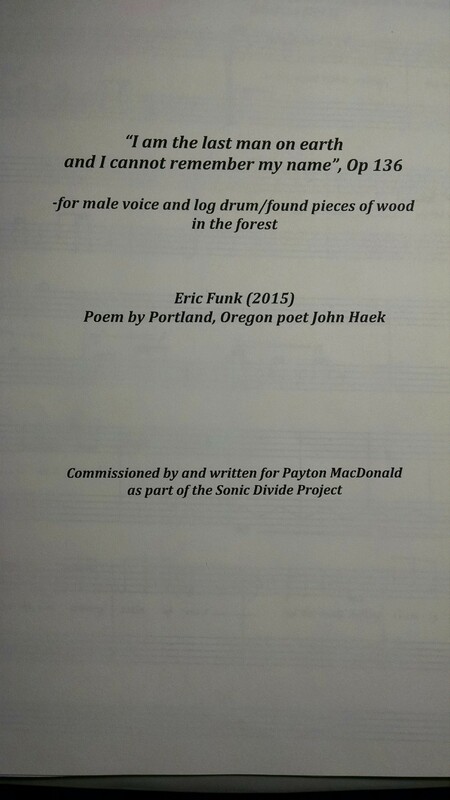 Eric wrote for voice and log drum/found pieces of wood from the forest, with text by John Haek. I’ve already learned the first page and I love it. The second line is “I am alone on the summit of a mountain . . .” I’ll definitely perform this on one of the Divide crossings at the top of a mountain in Montana. Eric was born and raised in Montana. He still lives there and composes, performs, teachers, and runs an amazing PBS show about music in Montana called “11th and Grant with Eric Funk.” I’m really honored to have him on board with this project. Another composition . . .
Aakash Mittal sent me his Sonic Divide contribution yesterday. It’s a wonderful piece titled “Pahaar”, which means “mountain” in Hindi. He uses a creative method of melodic progression that gives me a lot of room to improvise, but within a structure that keeps the energy flowing forward. Given the title, the fact that Aakash spent much of his youth in Colorado, and that some of the Divide crossings are on some of the highest points on the route in Colorado, I’m thinking I’ll probably sing this piece at the top of one of those mountain passes, which go as high as 12,000 feet. Hopefully there will be enough oxygen for me! I’m so excited about this project. That makes five pieces I’ve received so far, and they are all perfect in every way.